Update the website before May 25, 2018 ⏳ to comply with the General Data Protection Regulation (GDPR). Let users opt-out and opt-in from being tracked by Matomo analytics. Check if Matomo is configured to mask two bytes of the users IP address. See discussion in https://openknowledgegermany.slack.com in #gdpr channel. @knutator posted a text template there which might be used. < Projekt > nutzt statt den üblichen externen Dienstleistern die datenschutzfreundlichere Technologie von Matomo, um statistische Auswertungen der Seitennutzung zu erhalten. 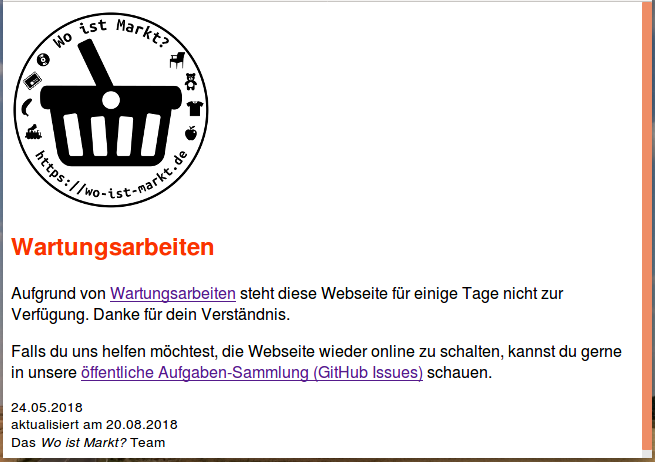 Wenn sie dies nicht wollen, <a href=“https://traffic.okfn.de/index.php?module=CoreAdminHome&amp;action=optOut&amp;language=de”>klicken Sie bitte hier und entfernen Sie den Haken. Näheres in unserer Datenschutzerklärung. Why not just remove Matomo and republish? I can't say if this would be enough to be compliant with the law - IANAL. I prefer that whoever works on the issue does a bit of research to be sure. to make the Website Matomo compliant only the snippet from @tursics is necessary, but @johnjohndoe is right. To make the page GDPR compliant, a data privacy statement is necessary. We updated our data privacy for OKFN at okfn.de accordingly, so we could use it and extend it with a paragraph, explaining the page is hosted via GitHub. @knutator2, thank you for the clarification. Please note that this website is currently hosted on a OKFN server - not via GitHub. If anyone wants to work on the GDPR topic so the website can go online again please do so. I will not be able to work on the issue all over July. 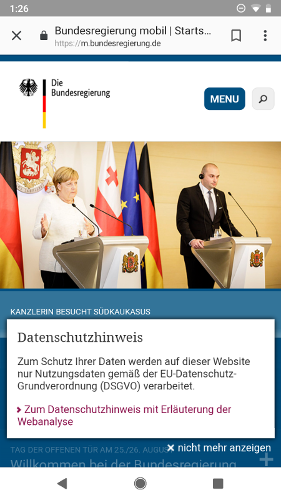 Here is how bundesregierung.de deals with it. They also use Matomo.